ODN 1720 (Control for ODN 1668) Endotoxin-free (sterile) 100 µg Ref. IAX-200-200-C100 Marque INNAXON 85.00	€ H.T. ODN 1982 (Control for ODN 1826) Endotoxin-free (sterile) 100 µg Ref. IAX-200-201-C100 Marque INNAXON 85.00	€ H.T. Neutral-ODN (Control for iODNs) Endotoxin-free (sterile) 100 µg Ref. IAX-200-202-C100 Marque INNAXON 85.00	€ H.T. Neutral-ODN (Control for iODNs) Endotoxin-free (sterile) 1 mg Ref. IAX-200-202-M001 Marque INNAXON 251.00	€ H.T. Neutral-ODN (Control for iODNs) Endotoxin-free (sterile) 3 x 1 mg Ref. IAX-200-202-3001 Marque INNAXON 553.00	€ H.T. ODN 2118 (Control for ODN 1585) Endotoxin-free (sterile) 100 µg Ref. IAX-200-203-C100 Marque INNAXON 85.00	€ H.T. ODN M383 (Control for ODN M362) Endotoxin-free (sterile) 100 µg Ref. IAX-200-204-C100 Marque INNAXON 85.00	€ H.T. ODN 2243 (Control for ODN 2216) Endotoxin-free (sterile) 100 µg Ref. IAX-200-205-C100 Marque INNAXON 85.00	€ H.T. ODN 2137 (Control for ODN 2006) Endotoxin-free (sterile) 100 µg Ref. IAX-200-206-C100 Marque INNAXON 85.00	€ H.T. TLR4 Agonist (Salmonella) Explorer Set I TLRpure 1 Set Ref. IAX-300-001-1 Marque INNAXON 249.00	€ H.T. TLR4 Agonist (Salmonella) Explorer Set II TLRpure 1 Set Ref. IAX-300-002-1 Marque INNAXON 412.00	€ H.T. TLR4 Agonist (E. coli) Explorer Set I TLRpure 1 Set Ref. IAX-300-003-1 Marque INNAXON 249.00	€ H.T. TLR4 Agonist (E. coli) Explorer Set II TLRpure 1 Set Ref. IAX-300-004-1 Marque INNAXON 444.00	€ H.T. 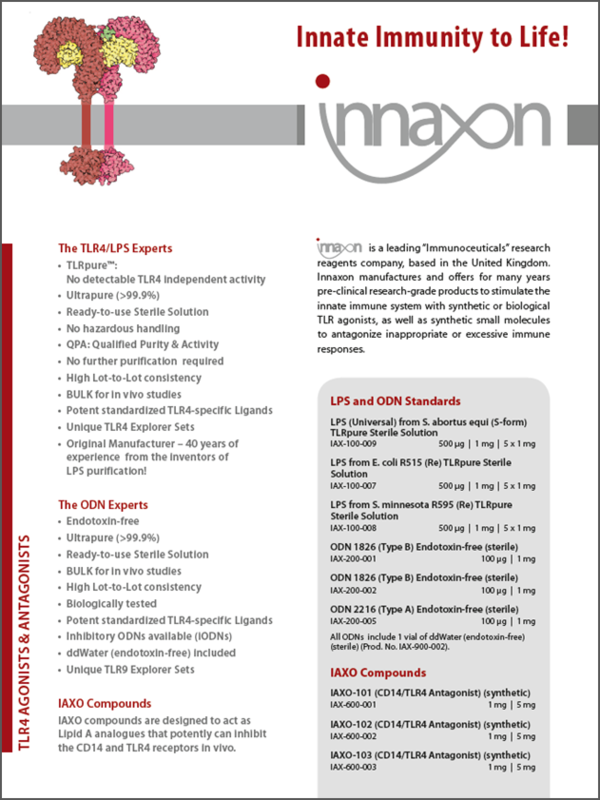 iODN Explorer Set I Endotoxin-free 1 Set Ref. IAX-300-005-1 Marque INNAXON 401.00	€ H.T. iODN Explorer Set II Endotoxin-free 1 Set Ref. IAX-300-006-1 Marque INNAXON 563.00	€ H.T. TLR9 Agonist (human) Explorer Set Endotoxin-free 1 Set Ref. IAX-300-007-1 Marque INNAXON 347.00	€ H.T. TLR9 Agonist (mouse) Explorer Set Endotoxin-free 1 Set Ref. IAX-300-008-1 Marque INNAXON 347.00	€ H.T. IAXO-101 (CD14/TLR4 Antagonist) (synthetic) 1 mg Ref. IAX-600-001-M001 Marque INNAXON 206.00	€ H.T. IAXO-101 (CD14/TLR4 Antagonist) (synthetic) 5 mg Ref. IAX-600-001-M005 Marque INNAXON 618.00	€ H.T. IAXO-102 (CD14/TLR4 Antagonist) (synthetic) 1 mg Ref. IAX-600-002-M001 Marque INNAXON 206.00	€ H.T. IAXO-102 (CD14/TLR4 Antagonist) (synthetic) 5 mg Ref. IAX-600-002-M005 Marque INNAXON 618.00	€ H.T. IAXO-103 (CD14/TLR4 Antagonist) (synthetic) 1 mg Ref. IAX-600-003-M001 Marque INNAXON 206.00	€ H.T. IAXO-103 (CD14/TLR4 Antagonist) (synthetic) 5 mg Ref. IAX-600-003-M005 Marque INNAXON 618.00	€ H.T. PBS Endotoxin-free (sterile) 1.5 ml Ref. IAX-900-001-LD15 Marque INNAXON 49.00	€ H.T. PBS Endotoxin-free (sterile) 10 ml Ref. IAX-900-001-L010 Marque INNAXON 87.00	€ H.T. PBS Endotoxin-free (sterile) 3 x 10 ml Ref. IAX-900-001-3010 Marque INNAXON 173.00	€ H.T. ddWater Endotoxin-free (sterile) 1.5 ml Ref. IAX-900-002-LD15 Marque INNAXON 33.00	€ H.T. ddWater Endotoxin-free (sterile) 10 ml Ref. IAX-900-002-L010 Marque INNAXON 65.00	€ H.T. ddWater Endotoxin-free (sterile) 3 x 10 ml Ref. IAX-900-002-3010 Marque INNAXON 130.00	€ H.T. Physiological Saline [Sodium Chloride 0.9%] Endotoxin-free Sterile Solution 1.5 ml Ref. IAX-900-003-LD15 Marque INNAXON 22.00	€ H.T. Physiological Saline [Sodium Chloride 0.9%] Endotoxin-free Sterile Solution 10 ml Ref. IAX-900-003-L010 Marque INNAXON 49.00	€ H.T. Physiological Saline [Sodium Chloride 0.9%] Endotoxin-free Sterile Solution 3 x 10 ml Ref. IAX-900-003-3010 Marque INNAXON 98.00	€ H.T. Argania Spinosa Kernel Oil (natural) (pure) 10 ml Ref. IAX-700-001-L010 Marque INNAXON 27.00	€ H.T. Argania Spinosa Kernel Oil (natural) (pure) 3 x 10 ml Ref. IAX-700-001-3010 Marque INNAXON 54.00	€ H.T. Argania Spinosa Kernel Oil (natural) (pure) 100 ml Ref. IAX-700-001-L100 Marque INNAXON 108.00	€ H.T. PBS Endotoxin-free (sterile) 100 ml Ref. IAX-900-001-L100 Marque INNAXON 206.00	€ H.T. ddWater Endotoxin-free (sterile) 100 ml Ref. IAX-900-002-L100 Marque INNAXON 173.00	€ H.T. Physiological Saline [Sodium Chloride 0.9%] Endotoxin-free Sterile Solution 100 ml Ref. IAX-900-003-L100 Marque INNAXON 141.00	€ H.T.